Air France flight 439 from Mexico City arrived in Paris CDG on 11-Jan-2016, and was the airline's last commercial 747 passenger flight. The service brings to an end over 45 years of 747 flights at the French flag carrier. Later in 2016 Cathay Pacific and Saudia will also retire their passenger 747 models. Once a ubiquitous sight, 747-400s are disappearing, 221 of them now remaining in service (according to CAPA's Fleet Database). 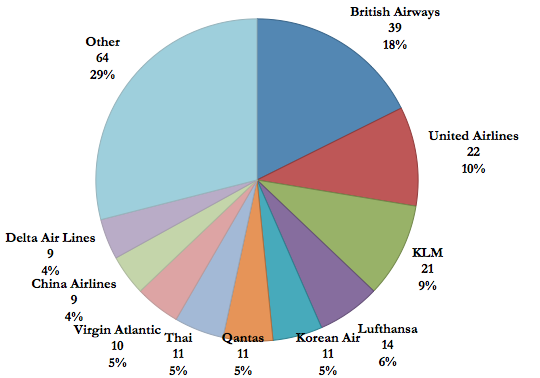 One third of them are in service with just three airlines: British Airways, United Airlines and KLM. BA operates almost twice as many 747-400s as the next largest operator, and still intends to have a 19-strong fleet by the end of 2020. Almost half of the world's passenger 747-400s are with European carriers, but seven of the world's 10 longest 747-400 routes are to/from Australia, all operated by Qantas. Of the 15 longest 747-400 routes, all but one are to/from Asia-Pacific. The fading of the 747-400 has meant a diminishing role on long haul routes. 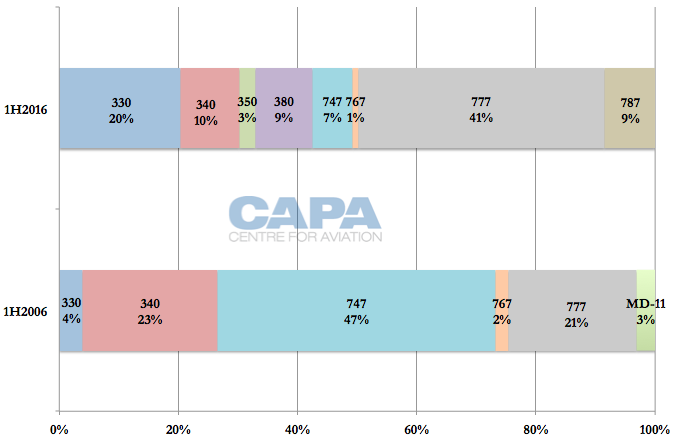 The aircraft type accounted for nearly half of Asia-Europe and Asia-North America flights in 1H2006, but in 1H2016 it accounts for less than 10%. On the trans-Atlantic, 747 flights have gone from a 15% share to 9%. 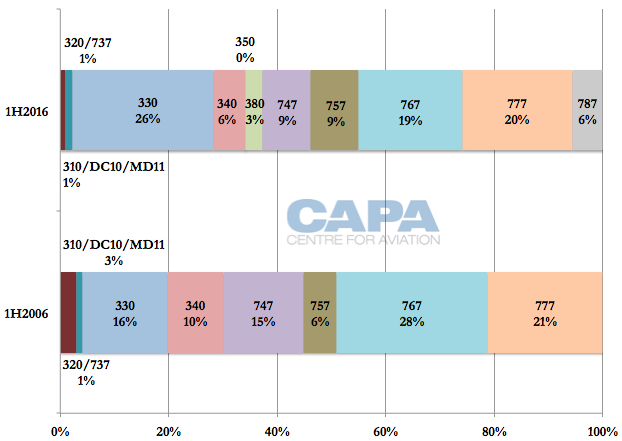 CAPA's Fleet Database tracks 221 747-400 passenger variants (passenger, -ER, combi) in service with non-government/VIP operators. This includes a handful in service at charter carriers. By far the largest operator is British Airways, with 39, accounting for almost one fifth (18%) of the 747-400 fleet. 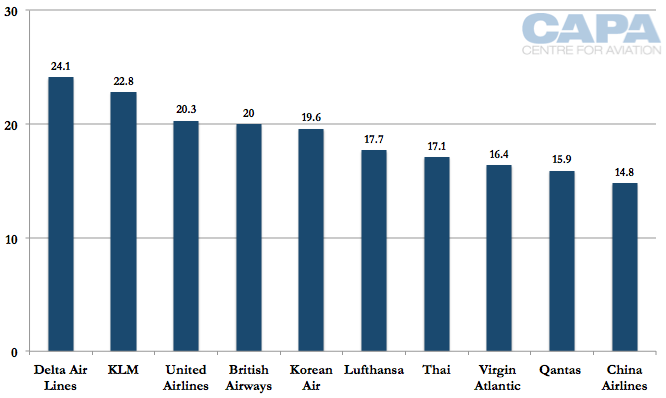 United Airlines operates 22 (10%), while KLM operates 21(9%). KLM operates a mixture of all-passenger and combi variants. 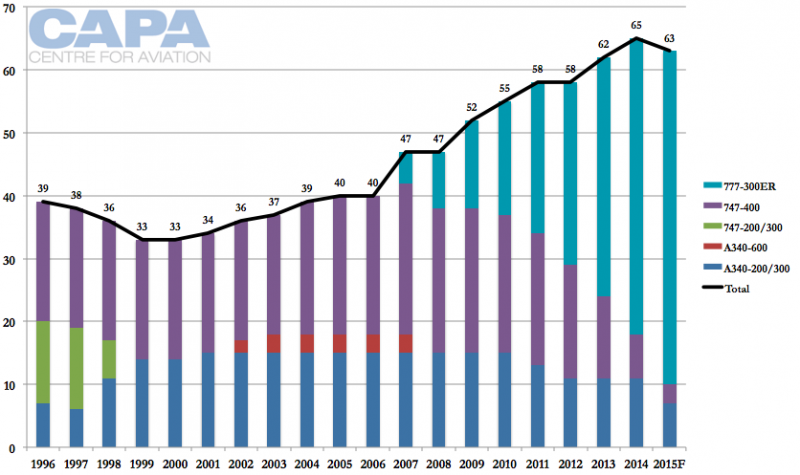 The three airlines account for one third of all 747-400s in commercial operation. Lufthansa, Korean, Qantas, Thai and Virgin Atlantic each operate 10-14 frames. Qantas is the only operator of the passenger -400ER, designed as a relatively inexpensive derivative to improve performance on Qantas' Los Angeles services. The oldest 747-400 in service is Delta's N662US, with a manufacture date of Jul-1988, making the aircraft 27.5 years old. Sister ship N661US – the first -400 ever built – was retired in Sep-2015. It will escape the claws of the wrecking machine and will instead be part of a museum collection. The next two oldest 747-400s are in service with Delta and AF’s sister airline KLM, each manufactured in Nov-1988. It is thus unsurprising that Delta and KLM operate the world's oldest 747-400 fleets, amongst the major operators. Delta's 747-400 fleet averages 24.1 years and KLM's 22.8 years. The 747-400 makes up just 1% of Delta's fleet, but 19% of KLM's passenger fleet. 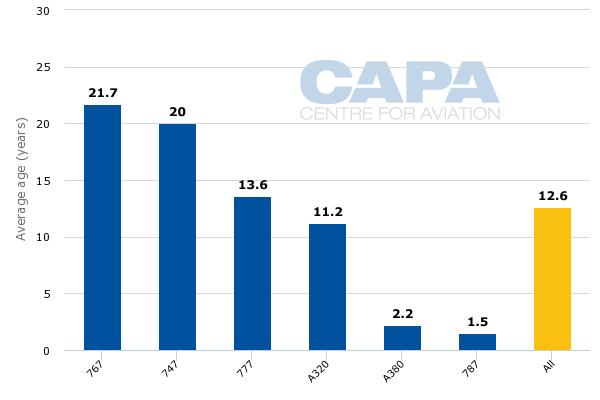 The 747-400's average age in Delta and KLM's fleet is above the average, inflating each carrier's total fleet average age. Delta does have a few aircraft families with a fleet age similar to that of the 747, following its strategy to operate cheaper, older aircraft. At KLM, however, the 747 is more than twice the age of KLM's next oldest aircraft family. At British Airways, which operates the most 747s, its average 747 fleet age of 20 is less than the 21.7 years of its 767 fleet. The last 747-400 passenger aircraft built, B-18215, is 10.9 years old and is still in service with China Airlines. 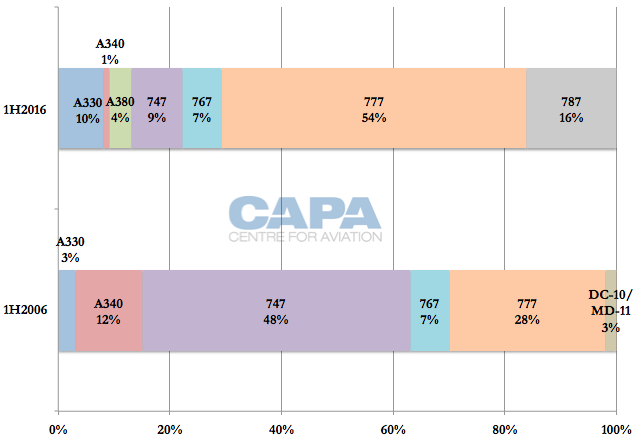 46% of the remaining 747-400s are in service with Europe-based carriers. 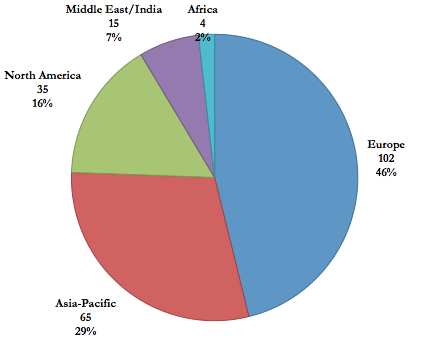 29% are with carriers in Asia-Pacific and 16% in North America. Seven of the world's 10 longest 747-400 routes are to/from Australia and all are operated by Qantas, including the top six. The four longest 747-400 routes are served less than daily. In Qantas' case, it is A380s that operate additional services, or the majority of frequencies. The longest daily 747-400 route is Brisbane-Los Angeles, the fifth largest. Of the 15 longest, all but one – BA's London Heathrow to Cape Town – are to/from Asia-Pacific. BA's Cape Town service is double daily in southern summer, and is by far the highest frequency of long 747 routes. This list excludes routes operated by the 747-8 variant. If they were included, only one – Air China's Beijing-New York JFK – would appear in the ranking, at number nine. Three airlines plan to end their 747 passenger operations in 2016. Air France ended commercial 747 services on 11-Jan-2016, but will have special retirement sightseeing services. Saudia, with four 747-400s, has regional 747-400 services and will have the last regular (non-Hajj/Umrah) service arrive back on 01-Apr-2016. Cathay Pacific operated 24 747-400s at its peak. As of Jan-2016 it operates three, all on regional services (mostly to Tokyo Haneda and Narita), and it expects the three to exit the fleet by the end of the year. Cathay and Saudia will remain 747 family operators due to freight models (including the relatively new -8 variant at Cathay). Air France, however, has withdrawn its 747 freighters, and its termination of passenger 747 flights marks the end of the line for the 747 type at Air France. Delta used to be a major 747-400 operator. A few years ago its 20 747-400s made it one of the top operators. Delta retired four 747-400s in 2014 and plans for the remainder of its fleet to exit by the end of 2017. 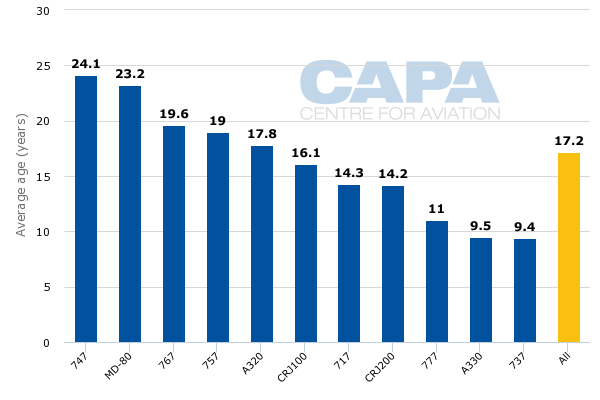 As CAPA has previously observed, British Airways regards the operation of older aircraft as improving capital efficiency. 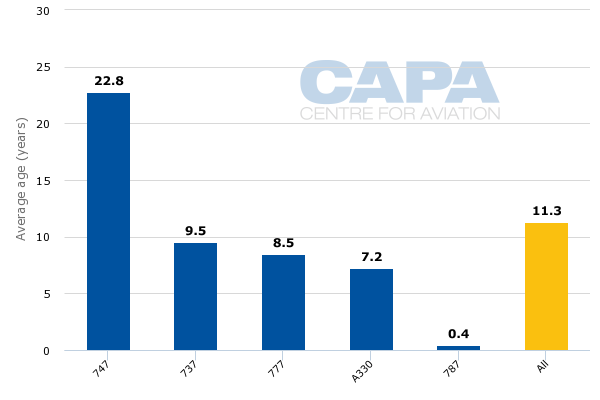 BA's 747 fleet, with an average age of almost 20 years, has reduced in number from 43 at the end of 2014 to 39 as at 9-Nov-2015, reducing further to 36 in 2016, and then to 19 at the end of 2020. Retaining 19 747s in 2020 is a halving of BA's current 747 fleet, but is still more 747s than most other airlines operate, with the exception of United (22) and KLM (21). It is likely that BA will continue to have the largest 747-400 fleet for the foreseeable future. BA has, for a number of years, operated a proportion of its 747 fleet under a so-called 'High J' configuration: 84 premium seats (of which 70 are business class), 30 premium economy and 177 economy class. BA recently started to modify 18 of its 747 aircraft into a 'Super High J' configuration, adding an additional 16 business class seats, and taking the premium total to 100 (of which 86 are in business class), whereas the number of economy seats is reduced from 177 to 145. The total number of seats on these 'Super High J' aircraft will now be 275, versus 291 in the original ‘High J’ configuration (and compared with 337 seats on the 'Mid J' 747s). See related report: IAG: capital efficiency can help a European legacy airline group to "show me the money"
The 747 was once a long haul staple, but is fading as it is withdrawn from service. In two ultra-long haul markets – Europe to Asia, and North America to Asia – the 747 accounted for almost half of all flights. On the trans-Pacific (North America to Northeast/Southeast Asia non-stop) the 747 has descended from operating 48% of flights in 1H2006 to 9% in 1H2016. For the Europe-Northeast/Southeast Asia non-stop market, the 747 operated 47% of flights in 1H2006, but only 7% in 1H2016. On the trans-Atlantic (North America to Western Europe), the 747 was not so prominent, operating 15% of flights in 1H2006 but 9% in 1H2016. Since the trans-Atlantic is the largest long haul market, that still means by number of flights (and not just percentage) the 747 is common there. If there is a silver lining to the dethroning of the 747 as "Queen of the Skies", it is that Boeing has kept the business within the family: 747s have mostly lost ground to Boeing's 777. That said, in the trans-Atlantic market, the utilisation of the A330 has rapidly increased and it operates as many services as the 777 and 787 combined. Competitor Airbus' A380 may be the new iconic aircraft, but its lower numbers and presence on routes put it still in the minority. Airbus may have won the iconic aircraft competition, but for sales volumes it is Boeing that reigns. There are ongoing questions surrounding the Airbus A380 and Boeing 747-8 programmes, with some observers predicting a limited future. Even if there is a long history for one or both of the types their production will be limited in size, with neither manufacturer expecting to better the long term success of the 747-400. With the impending exit of the 747-400 aviation supremacy will go with it, in favour of more risk-averse, carefully planned and conservative fleet strategies. Some years ago airlines shifted from the 747-400 to smaller 777s, and now there appears to be another shift from the 777 to the smaller 787s and A350s. From Hainan to Norwegian, the direction of airlines into the future is now to construct their long haul networks without large iconic aircraft.